Noodles and Company Delivery is an award winning restaurant and delivery service of some of the nation’s most beloved sandwiches, noodle dishes, soups, and fresh salads. All dishes are handmade to order and are comprised of only the freshest of ingredients for healthier, comfort meal options, just perfect for family dinner night, to share a meal with friends, or catering a party. 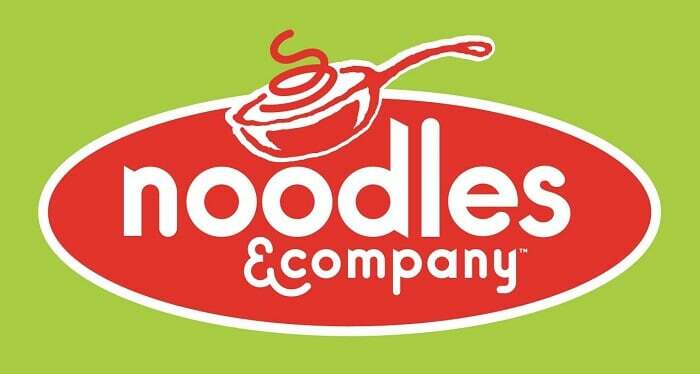 The Noodles and Company Delivery restaurant is a one-stop-shop for all of your cozy noodle cravings. Whether it’s creamy Wisconsin Mac and Cheese, cheesy Alfredo MontAmore, or exotic Japanese Pan noodles, and more, you are sure to get your noodle fix at Noodles and Company. In addition to mouthwatering noodle dishes, Noodles and Company also specializes in a variety of soups and salads inspired by various flavors from around the world, such as Napa Market Salad with Chicken, Chicken Veracruz Salad, Tomato Basil Bisque, Chicken Noodle Soup, and more. Grab a Mediterranean Salad as the perfect accompaniment to your Spaghetti and Meatballs or a bowl of Thai Curry Soup with your Spicy Korean Noodles for the perfect weeknight treat! There’s even something for vegetarians, such as Pesto Cavatappi, Buttered Noodles, Whole Grain Tuscan Fresca, and more. In addition, many menu items can also be made gluten-free for gluten sensitive individuals, including the Penne Rosa, Spaghetti and Meatballs, Wisconsin Mac and Cheese, and more. For individuals who are watching their weight, Noodles and Company offers various smaller portions of their main offerings that are just 500 calories or less, including the Penne Rosa, Spicy Korean Beef Noodles, Buttered Noodles, and more. For the sodium conscious, there are various low sodium options, such as the Bangkok Curry, Buttered Noodles, and more. There’s also various menu items for those who are watching their sugar, such as Whole Grain Tuscan Fresca, Pesto Cavatappi, and more. Mac and Cheese lovers will find bliss in Adult Mac and Cheese offerings such as Bacon Mac and Cheese, Buffalo Chicken Mac and Cheese, and BBQ Pork Mac and Cheese. There’s also a kids menu designed in collaboration with the National Restaurant Association’s Kids Live Well program, which offers a number of Healthy Dining Nutrition expert approved meals for kids, such as Kids Grilled Chicken Breast with Marinara Sauce, Kids Wisconsin Mac and Cheese, and more. Begin your meal with a delicious shareable, which includes Cheesy Garlic Bread, Korean BBQ Meatballs with Gochujang Sauce, and more, and end it with one of a number of dessert options, which includes Cookies, and more. They also offer a variety of drinks, including Horizon Organic low fat milk for kids, beer, wine, and more. With their own in-house catering services, you can enjoy your favorite Noodles and Company dishes just about anywhere and for any occasion. Order a big pan of your favorite noodle dish, which comes complete with plates, knives, forks, serving utensils and napkins, or opt for a catering package, which includes a selection of items such as your choice of 1 or more pans of your favorites, cheesy garlic bread, tossed salad, and more. Noodles and Company is located in various areas throughout the US, including Ohio, New York, Kentucky, Kansas City, Pittsburgh, and more. To find a Noodles and Company Delivery and restaurant in your area, simply visit their Locations Page, and enter your city, state, and zip code into the information box for a list of locations near you. Typical hours of operation for most Noodles and Company Delivery restaurant locations are from 11 am to to 10 pm. However, times do vary based on your location. For exact opening and closing times in your area, simply key your location into their Locations Page for a list of local area restaurants and hours of operation. Noodles and Company Delivery restaurant fees and prices vary, depending on your location, your menu selection, and your dining option. Typical menu items range anywhere from about $2 for sides to about $9 for entrees, while big pan and catering prices will depend on the size of your group. Catering requires at least a 24 hour notice. Noodles and Company is committed to providing delicious meals which feature real food, real flavors, and real cooking. When they say real food, they mean food free of artificial flavors, colors, sweeteners, and preservatives. In other words, customers will enjoy authentic foods like organic tofu, cage and antibiotic-free eggs, and antibiotic and hormone-free pork and bacon for natural flavors you can taste the difference and feel good about. Each meal is handmade to your specific order and is prepared using the freshest of ingredients, for a memorable dining experience. Additionally, meals are prepared in an open kitchen, so customers can enjoy watching their food sizzle in big blue pots as it is sauteed to perfection right before their eyes. Meals are prepared using real sauces, soups, dressings and herbs, such as lemongrass, turmeric, coriander, basil, and tomatoes for fresh, pure flavor you can savor. In addition, Noodles and Company Delivery restaurant also prides itself on providing a comfortable place to gather together, to further compliment the meal. Noodles and Company Delivery restaurant is continuously growing and evolving in an effort to improve the customer experience. To stay in the know about recent news, special invitations, offers, giveaways, and more, simply join their Eclub. Meals can be ordered online or call 1-844-366-6353 for a catered package today. Hey Buddy!, I found this information for you: "Noodles and Company Delivery 101: Areas, Hours, Fees". Here is the website link: https://all2door.com/noodles-and-company-delivery/. Thank you.